Rare and critical metals are playing a crucial role in recent scientific advancements, especially in the environmental technologies and energy sectors. These advancements in today’s and tomorrow’s green technology are driving industrial countries like the United States to allocate significant funding for breakthroughs in alternative fuels for vehicles and alternative energy storage. Furthermore, there is an increasing scientific consensus that we need to protect the environment from growing pollution, while frustrated drivers continue to bear the cost of emissions through surging gas prices. On these premises governments have been pushing policies which foster sustainable consumption and production efforts. These calls for action reinforce the belief that the clean energy sector is definitely here to stay. Spearheading the progression are two frontrunners; Lithium and Graphite. Both are key resources in developing higher range and lower cost electric vehicles, specifically in the application of Lithium batteries. Graphite is a key component in rechargeable Lithium batteries, with China cutting back production and with the west’s supply replacement and much needed new supply not on stream Graphite’s price value is yet to level. By comparison, Lithium, which has already gone through one price surge, is seeing it’s demand prices firming, and with the rechargeable battery industry for EV’s and consumer electronics driving demand, forecasters believe lithium’s price could as much as double in value in the near future. Lithium is the next step to reducing greenhouse gasses and supporting sustainable development – it is a vital component in many environmental technologies. It is the lightest of the metals and provides considerable savings due to its high energy density which is crucial for energy storage in mobility applications. Already the most widely used battery in portable electronics’ the Lithium battery is also the choice of preference for plug-in hybrids, mainly for its chemical attribute allowing us to create the batteries with specific power and energy capacity without the so called memory effect – with every charging cycle the battery loses part of its capacity. There is currently no substitute for Lithium; hence it has to be either obtained through salar brines by way of evaporation or through mined hard rock. International Lithium is a global Lithium and rare metals exploration company with a dynamic portfolio of projects worldwide, particularly in Lithium-rich Argentina, Ireland and Canada. 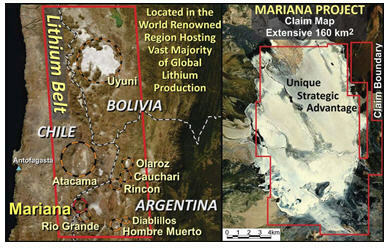 ILC was successfully launched into the market in 2011 through a spin-out from their parent company TNR Gold Corp. With their previous experience, a strong management team as well as a balanced portfolio, ILC was able to secure Ganfeng Lithium Co. Ltd., a globally recognized Lithium manufacturer as a key partner and investor. Gangfeng recently increased its equity stake in ILC to 14.7% on a non-diluted basis. The company is a professional producer of lithium products which has developed a comprehensive product chain, including lithium metal and alloys, inorganic and organic lithium chemicals, supplies a wide range of lithium products for primary and secondary lithium battery market, pharmaceutical and new material industries. Ganfeng recently announced USD75million in sales revenue in their 2011 annual report, representing a 34% increase over the previous year. ILC’s overall approach is to build shareholder value through quality projects and strategic land positions; thus far they are off to a strong start and are rapidly accelerating operations. 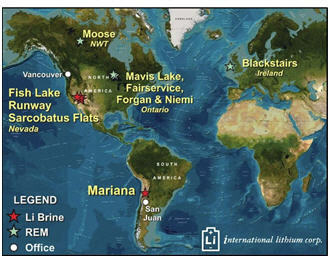 At present ILC has nine viable projects including operations within the world renowned Lithium Belt in South America as well as highly prospective Mavis Lake, Ontario and Backstairs, Ireland. Canada Highway. The property comprises a total of 2,624 hectares and encompasses a continuous pegmatite field exhibiting high-grade, well-evolved, lithium and tantalum zonation as well as significant levels of cesium and rubidium. A recent 20 hole drill program, totaling 1,750 meters, was completed on the property and exceeded expectations by revealing additional and more extensive pegmatite intersections than anticipated. One hole, MF11-12, drilled to the north of past exploration activity encountered a 78 meter pegmatite intersection reporting two intervals grading 1.86% Li2O over 26.25m and 1.22% Li2O over 28.45m. 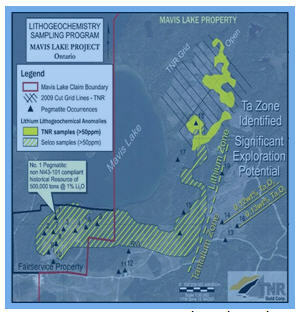 The discovery of this previously unknown high-grade lithium near surface pegmatite attests to the under explored potential of the property and the Company intends to expand the scope of the project in the coming year. 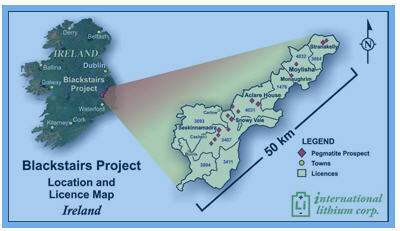 The Blackstairs rare metal pegmatite project located 80 km south of Dublin, Ireland, totals 292 square kilometers and encompasses the extensive NE-SW oriented 50 kilometer long Leinster Pegmatite Belt. Nineteen significant lithium pegmatite prospects have been identified along the trend primarily as boulder occurrences with five buried pegmatites revealed through a modicum of past trenching and drilling. The Aclare House pegmatite initially discovered through boulder prospecting is reportedly up to 20 metres wide, has been traced for more than 400 metres along strike and grades 1.5% Li2O. Recently ILC discovered an extensive high-grade lithium boulder field within a concentrated 250 x 250 meter area from a preliminary reconnaissance at Moylisha. Four samples were collected in this new area with three of the samples grading better than 3% Li2O and the highest returning an outstanding 4.59% Li2O. The density and size distribution of the lithium boulders at Moylisha indicates a potentially sizable, yet to be discovered buried pegmatite body and such significant findings from a cursory investigation highlights the potential to discover additional buried pegmatite bodies elsewhere on the Property. strategically encompasses the entire salar effectively ruling out any competition for the lithium-potash brine resident within the basin. Initial sampling of the surface brine revealed highly compelling geochemistry returning average grades of 440 mg/L lithium and 12,700 mg/L potassium. 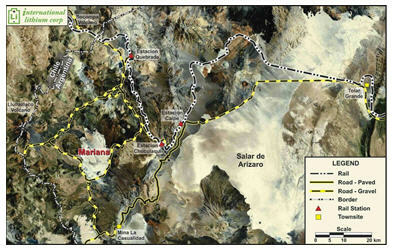 The lithium grades are comparable to early stage exploration from other salars in the area, however the potassium levels represent one of the highest grades outside of the world class operation on the Atacama salar in Chile. potash brine exploration model. This setting, in conjunction with the high brine density and flow measurements during drilling, indicates the potential for a significant brine aquifer at the Mariana lithium-potash project. Drilling results are anticipated shortly and according to the Company will provide the basis to rightfully rank the Mariana project amongst some of the more advanced lithium-potash brine projects in the world. Responding to industry demand and growing global focus on sustainable development International Lithium Corp. is opportunely positioned to advance in the Lithium Market. With a stable Canadian currency that is encouraging international trade, diverse global assets and a strategic partner, they are well on their way to providing strong value to their shareholders and securing a threshold in lithium assets. Is International Lithium Corp. TSX.V – ILC on your green radar screen?